Please note that the conference will now be held over 3 days, from 2.30pm on Tuesday 16th Sept to lunchtime Thursday 18th Sept. The Students applied training will now be held on Tuesday 16th Sept morning and on Friday 19th Sept afternoon. THE DETAILED SCHEDULE IS NOW AVAILABLE BELOW AND UPDATED REGULARLY. The conference will represent an excellent opportunity to join experienced scientists and industrial partners describing their recent work on experimental and theoretical techniques, challenges, and applications of Paramagnetic Nuclear Magnetic Resonance (NMR) to a wide range of materials. The invited speakers are leading specialists in the paramagnetic NMR field and the talks will cover a range of topics from the development of new techniques to obtain high resolution NMR spectra of inorganic and bioinorganic systems, to recent advances in the implementation of paramagnetic NMR shift calculations for periodic and molecular systems in a number of commercial and open-access codes. There will be a poster session on September 17th, late afternoon. There are no formal registration fees for this scientific conference. 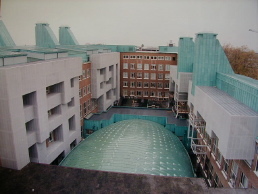 It is organised as part of the EU Marie Curie Initial Training Network project “pNMR”. However there is a limited number of participant spaces available. Registration can be found on this page further down. The hotel costs will be at the expense of the participant. 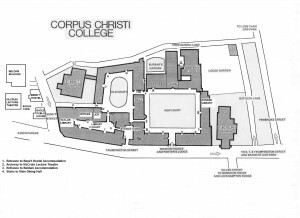 A link is being sent to participants to book their own bedrooms at Corpus Christi once registered. 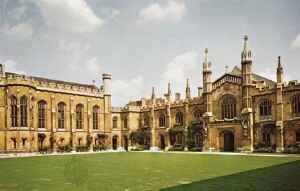 The conference will be hosted in the beautiful location of Corpus Christi College, in the heart of Cambridge. Participants will be accommodated in guest rooms in Corpus Christi, and a formal dinner will take place on Wednesday, September 17th, in the College’s dining hall. A small guide of Cambridge is available here. Maps on how to reach the Chemistry Department on Tuesday 16th Sept morning and/or Corpus Christi College on Tuesday 16th afternoon are available here. A poster session will be held on Wednesday 17th Sept afternoon. The poster abstract may not exceed ONE PAGE of text, references, tables and figures. The submission deadline is Thursday 31st July 2014. Please send your abstract as yourname-surname.doc to pnmr14@pnmr.eu or submit it with the conference registration form available further down. An applied training will be held for PhD students on the morning of Tuesday 16th and the afternoon of Friday 19th of September. Please register early as spaces will be limited. 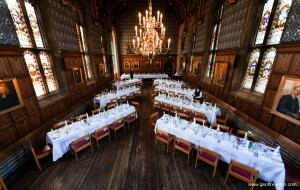 It will be hosted by members of Prof. Clare Grey’s group, in the Department of Chemistry (http://www.ch.cam.ac.uk/). 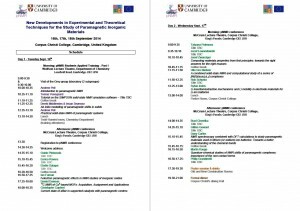 This event will focus on the application of pNMR to inorganic materials (in particular to battery and fuel cell materials, the expertise of the Prof. Clare Grey’s research group), and to bioinorganic systems. There is no registration fee for the training, as it is organised as part of the EU Marie Curie Initial Training Network project “pNMR”. Note however that spaces to some parts of the workshop (on Friday) will be limited. The Tuesday workshop is open to all attendees of the main meeting. Registration can be found on this page further down. The hotel costs will be at the expense of the participant. Please see the accommodation prices further down. A two-hour hands-on tutorial on how to write, edit a scientific paper and get it published, given by Guy Jones, Deputy Director for the RSC’s Inorganic chemistry journals. Deputy Director for the RSC’s Inorganic chemistry journals. Thank you to fill in our registration form before Friday 15th August 2014. REGISTRATION IS NOW CLOSED. pNMR Fellows BOTH Training courses are compulsory for pNMR ESRs and ERs. Accomodations Accomodations located within Corpus Christi College and are single standard bedrooms with shared bathroom facilities at £69.30 per night. Breakfast, VAT and Internet Access are included in the fare. 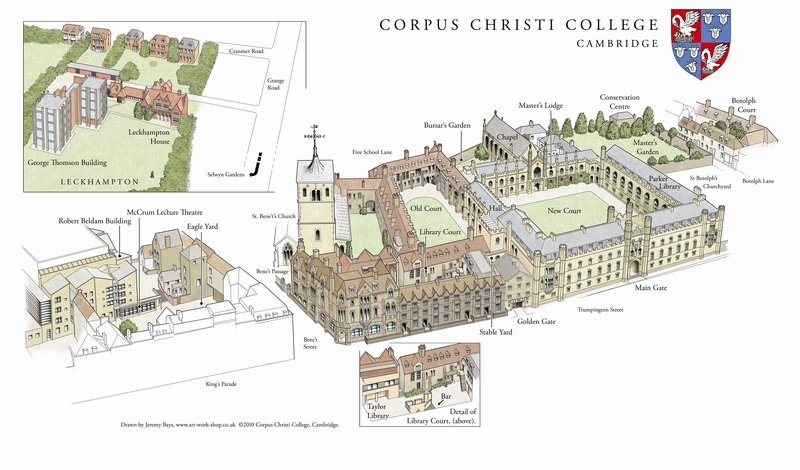 As attendees will have to pay for their own accomodation, a link for booking bedrooms at Corpus Christi is being sent to participants as soon as they register. Check-in Please indicate your check-in date for the hotel. Check-out Please indicate your check-out date for the hotel. Accomodations-pNMR Network members pNMR Network project members check out date will be Friday 19th Sept as the Mid-Term Review meeting (compulsory project meeting) will be held on the 18th afternoon-19th morning. Thank you. Poster Please upload your poster abstract here. Prefered file extension : pdf.